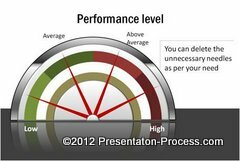 Custom animation makes it easy for a chart to be understood. Not all custom animation effects give a professional feel when applied to charts. 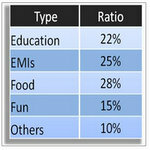 In this article, we will learn the preferred custom animation type for different types of charts. The main purpose of animating a chart is to accentuate the nature of the chart. Sometimes the animation shows the way data is arranged. 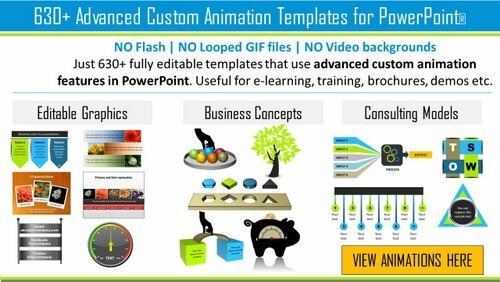 The key point to remember is – never to use custom animation as a decorative element on your slides. 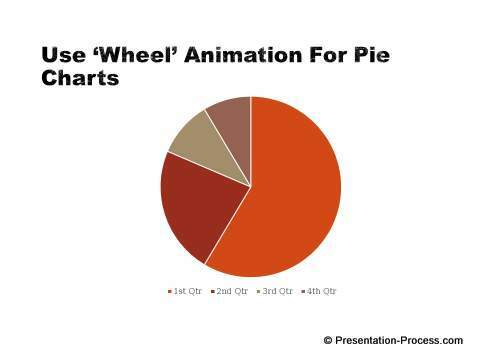 If a custom animation doesn’t add value to the chart, it is better not to include it. Wipe animation is a subtle effect that doesn’t crave for audience attention. 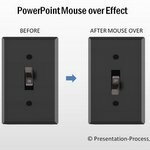 So, it is a useful option to use in business presentations. The direction of wipe gives a cue to the way the chart displays information. A line chart shows ‘trend over time’. The timeline moves from left to right. So, it is only natural that the direction of the wipe moves from left to right. The animation makes the chart looks like it is drawing itself. A bar chart is usually oriented from left to right. 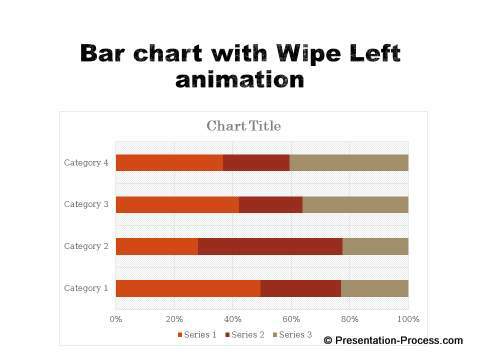 ‘Wipe Right’ animation applied to bar chart follows the natural orientation of the chart. That is why the animation appears appropriate. Applying the same logic we discussed earlier, the columns in a column chart point upwards. So, a wipe animation to the upward direction follows the natural orientation. The animation also helps us get a feel for the height of different columns easily. 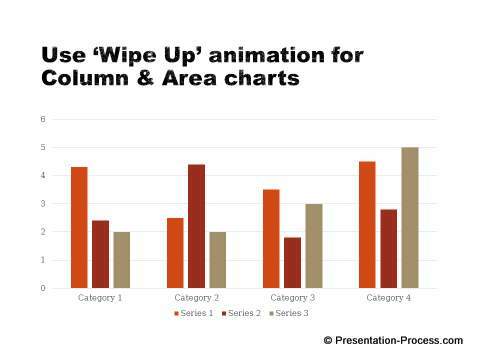 When we apply ‘Wipe Up’ animation to area charts, the chart gives a feeling of getting filled up from the bottom. That is a simple way to get a feel for the area occupied by different categories of items. A pie chart looks like a wheel with spokes. So, ‘Wheel’ animation suits the chart type perfectly. You can have each segment to appear on click for added drama. The axis for Radar Charts is placed in the center. The numbers increase from the core to the fringes. 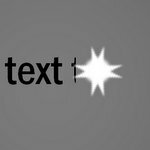 So, ‘Zoom’ animation follows the direction in which the numbers are placed in the axis. The emphasis for bubble charts is the ‘placement’ of those bubbles on the chart. 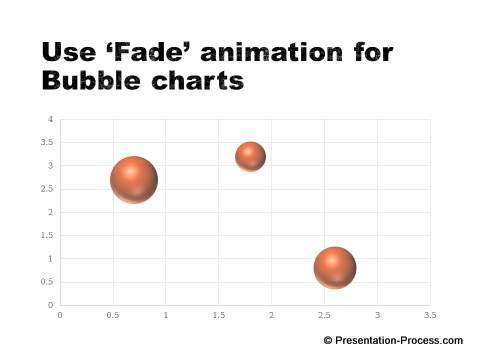 ‘Fade’ animation indicates the placement in a subtle fashion, while allowing the presenter to explain the significance of each bubble as it appears. 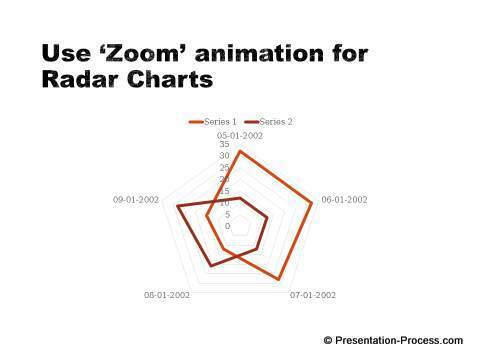 Thus, with a little bit of application, we can find the right kind of animation that adds value to our charts. 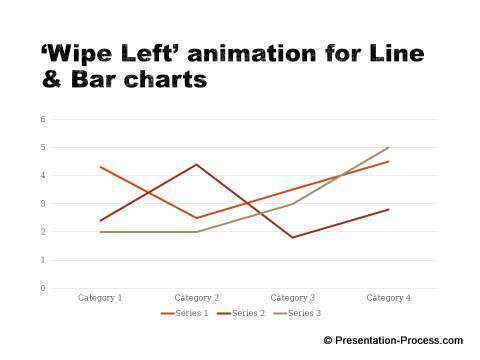 Using the right custom animation for charts is one way to impress business audience. 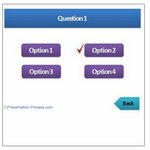 Another way to impress them is to use high quality graphics and diagrams for business presentations. However, it takes a lot of time and effort to create high quality graphics and diagrams from scratch.